Being an Android user, i always keep on searching for stuffs related to it. In this Smartphone arena and Internet world. Your speed is depended on your internet and phone performance. So to maintain our performance we need to increase speed of Android phone. So here i will teach you how to increase WiFi speed on android and also how to increase internet speed on android. Without internet , you can not do much with your expensive Smartphone. And a slow speed internet is just waste of time and life. But in India , you can not expect a high speed internet. So we need to find some alternative ways to increase internet speed on Android phone. Lets discuss here the methods to increase Internet download speed on Android. Your internet speed depends on lots of factor like your Mobile Carrier, Phone processor and RAM, WiFi speed if you run internet through it. So to increase speed on Android you need to consider all these. You can increase Android RAM using SD card. There are many methods and trick to increase WiFi speed of Android phone. You can do some manual actions or can use apps to directly speed up your Android Wifi. 1. WiFi | Mobile Network Speed : This app really work and definitely increase your WiFi and mobile network speed. Measure App Speed in Real Time. – Find the best Public WiFi connection. – Clean your Home WiFi channel. – Compare WiFi vs. Cellular Net App Speed. Choose the best network. – Control your Data Expenses! Never exceed your data quota again. These are all major features of this application. 2. Wifi Booster & Analyzer : It is a profession WiFi Analyzing tool. It analyze your internet and wifi connection and then helps you to increase internet speed or boost wifi speed. ✔Display your wifi info and wifi signal strength. ✔Provide Manual boosting mode with the network analyzer to lead you to move your device to a better place . ✔Detect the available wireless hotspot, wifi tether or wifi direct as a wifi detector. ✔Monitoring and analyze your network speed in background to ensure you have the fastest network speed. With this network booster you can only increase speed of Wifi not your mobile 2G 3G and 4G network. There are lots of ways to test your internet download speed. 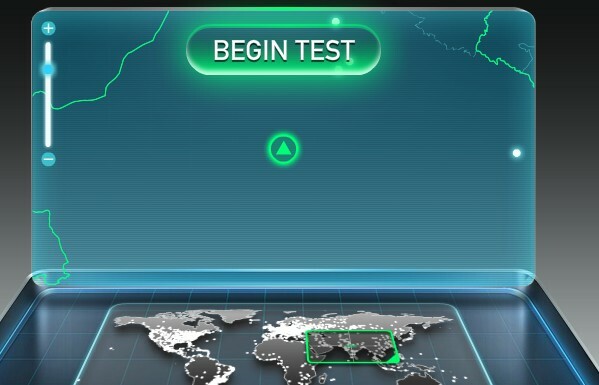 There are plenty of speed test websites that ping your ISP to estimate your Internet speed. This websites basically give you approximate value of your downloading and uploading speed. But according to my experience when i tested these websites , my download speed is far better. But when i tried to play some videos on you tube. It is not even touching the feet of that speed. So there is some difference, in your downloading speed and your surfing speed. So only testing your downloading speed with speed test websites will not give you clear picture about your internet connection speed. You must try to buffer 2-3 videos simultaneously to test it. 1. Speedtest.net : It is the best site to check your internet downloading speed. You just have to go to speedtest.net and then just click on BEGIN TEST button to start testing. And in few minutes it will show you a speed graph and your downloading and uploading speed. To test on Android Okla Speed test Android app is also available. And here is my speed test result. Which is very bad. Yes i know MTS is very bad internet service provider. You might not get right result in a single test , so just do 2-3 test and take their average. Well this is the reason why i am writing this article. My internet speed was very slow but then i tried some tricks to optimize my internet speed and some of they really worked. Now i am getting far better speed then earlier. So i will suggest you to try these methods to speed up internet. As we all know that our internet speed is totally depended on our Internet service provider. But its not only depend on your ISP only. There are many other factors that limits your internet speed. Like if you and your friend have same network , but different device. Now if your friend getting higher speed then you at the same location. Then this is clear that there is some issues with devices also. So here are some quick tips to boost Android Internet speed. The first thing that you need to do to increase internet download speed in Android is Go to Settings>> Wireless & Networks. Then in Options you will find GPRS transfer prefer. Here change the settings to data prefer instead of call prefer. It will increase your data transfer rate which will speed up your internet downloading speed. 1. Clear Android Phone Cache : Generally Android devices get slow due to less cache memory. Your cache memory is limited and its get full when you run different apps. So you need to clear your cache regularly to maintain your Android performance. 2. Running Unwanted apps : Some unwanted apps keep on running at background and utilize large part of our processor. So you need to identify those apps and close them. As such all in all Android devices you can clear unwanted apps by holding Menu key. And also uninstall the apps that you are not using frequently to reduce burden on your processor. 3. Right Browser Selection : browser selection has greater effect on Internet speed on any device. I will suggest you to use Opera Mini or UC Browser. They are the best browser and have high data transfer rate. Just try opera mini and compare the speed with your old browser. You will clearly see the difference. 4. Use 3G(WCDMA) or 4G (LTE) networks : I am not telling you to recharge for 3G or 4G. Just switch to 3G or 4G networks even if you have recharge of 2G. And also don’t forget to Enable 3G in your phone. Just Go to Settings >> Wireless & Networks. Enable 3G here. Now even you have 2G internet pack but you can get slightly increase in your Internet speed. 5. Managing Permission to access Data for apps : There are plenty of apps that keep on using data in background without our knowledge like Gmail , games etc. Due to this there is decrease in speed and we lose our data also. So you need to stop such apps to access data. You can use any third party apps to prevent these apps to access data. Like you can use Task manager application and block all those apps that are wasting your data. 6. Increase Network Signal With Android app : The main reason of slow internet is less Network strength at you location. So either complain about this to your ISP or switch to better network. And you can also use these Network booster apps. If these methods does not help you in increasing your internet speed. Then you can try these Internet booster apps for android. Just search for internet booster on play store. You will find many apps. Read their review and select the best. According to my experience, i found increase of 15-25% in my downloading spped after trying all these methods. So you must also try, you will surely increase your internet speed. where is the “GPRS transfer prefer” setting in micromax unite 2 A106 kitkat phone ?